Thanks to the Thomson-Dunlop Research and Conservation Internship, I had the opportunity to spend four weeks in the autumn of 2017 at St Cecilia’s Hall: Concert Room and Music Museum. This provided me with an amazing experience in an energetic and supportive environment where the deep knowledge of musical instruments preservation is fruitfully combined with a welcoming and enthusiastic team. 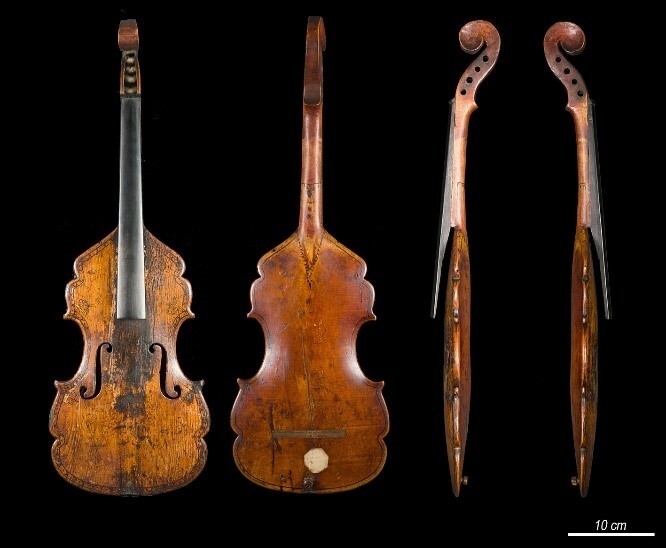 The project I undertook was driven by the interest in, but lack of knowledge of, two rare musical instruments in the University’s collections known as “violins without sides,” “rib-less violins” or “flat violins” (I strongly suggest you to come and see these instruments at the Museum as they are quite unusual!). There are only three such instruments known and all of them are currently held in Scotland: two at St Cecilia’s Hall and a third at Dean Castle in Kilmarnock. What a fortunate coincidence. 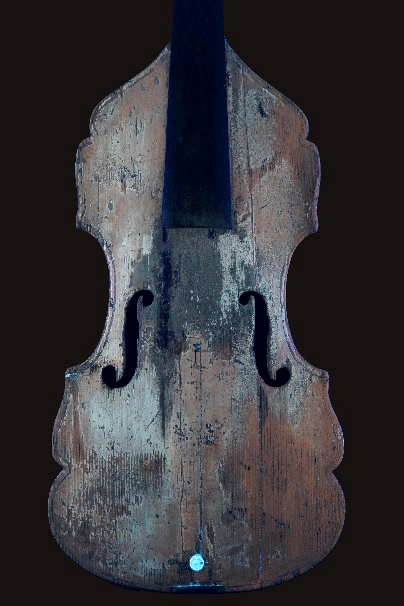 Overall, little is known about these intriguing instruments and this project aimed to clarify dating, provenance, and attribution, as well as to try and establish their function within a musical context. To reach these outcomes, the instruments were investigated using both historical and scientific approaches. The scientific analysis of the instruments was my main task. 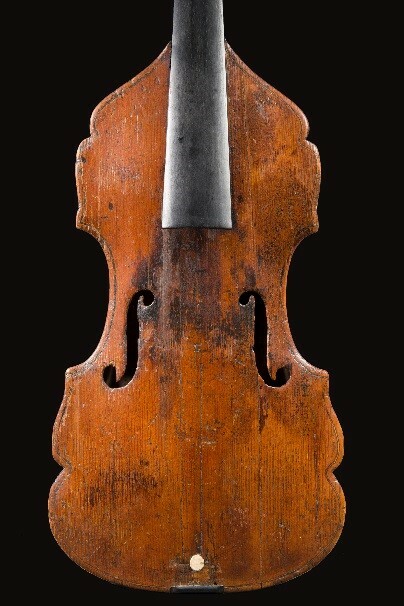 I used photographic documentation both in the visible light range and under UV induced fluorescence to learn about the materials used in the violins’ construction, understand their current condition, and to see evidence of prior conservation and repairs. Next, Computed Tomography (CT) scanning allowed for the analysis of the inner structure of the instruments, shedding light on the manufacturing processes. In addition, these CT images were used for non-invasive dendrochronological investigation to figure out the age of the wood – thus clarifying the dating of the objects. Finally, I carried out spectroscopic and microchemical analysis on the materials used in the violins’ construction. This provided information on the oils and the resins used by the maker for the varnish. The results of this study, combined with the historical research being completed by a fellow intern, will provide more information of these mysterious objects. Violin in UV light. When UV light is absorbed by certain materials, it is reflected towards the eye as longer wavelength visible radiation (visible light). The presence of fluorescence may assist with materials identification, detecting damage or surface coatings, and uncovering areas of previous restoration. The colours of the observed fluorescence will depend mainly, but not only, on the material. This internship has been a special experience for me, both professional and personally. I have gained valuable skills which will be highly beneficial for my career development. Moreover, this internship allowed me to meet great people and work in a very positive and supportive environment. I have learnt a lot about musical instruments whilst acquiring conservation knowledge through hands-on experience. Discovering the amazing treasures in the wider CRC collections has shown me the advantages of the cooperation between great teams of conservators and museum professionals in a well-connected and collaborative environment. Finally, as an intern from Italy, this experience not only provided growth on a professional level, but was an amazing opportunity to learn about Scottish culture and to discover Edinburgh, a truly fascinating city. I am excited to see the final results of the project and I look forward to future collaborations with St Cecilia’s Hall and the University of Edinburgh. Although usually practising and training within the realms of furniture, this summer kicked off to a musical start with a work placement at the CRC, under direction of their musical instruments conservator Jonathan Santa Maria Bouquet. 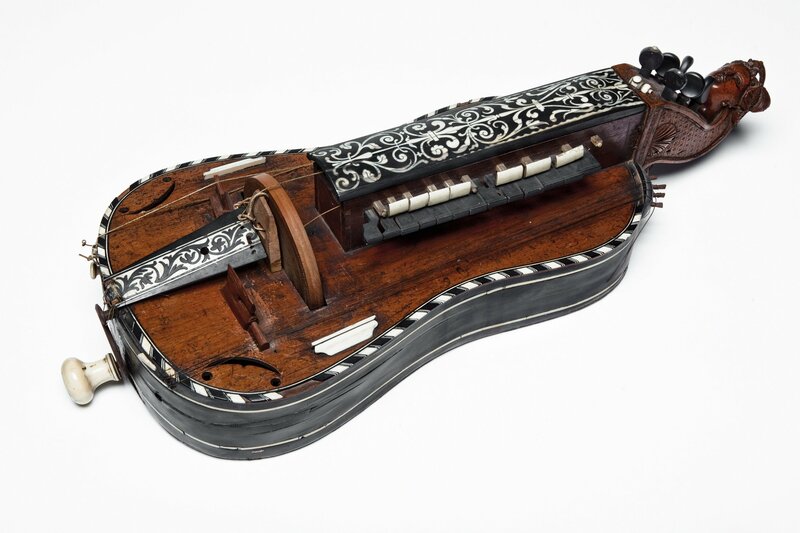 This was an especially exciting time due to the redevelopment of St Cecilia’s Hall, and I was presented with a number of objects to work with, one of which intrigued me more than anything else – a rather sorry looking late 18th century hurdy-gurdy (MIMEd 1052) made by ‘Ouvrard’ in Paris. In this week’s blog we hear from Musical Instrument Museums Edinburgh (MIMEd) Conservator, Jonathan Santa Maria Bouquet, who recently attended a training workshop on wood identification in Norway.